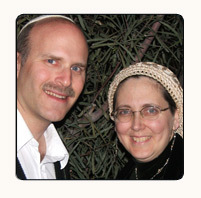 The Holy City Prayer Society is run jointly by Gideon and Devra Ariel of Maale Adumim, Israel. A graduate of the prestigious Birkat Moshe yeshiva of Maale Adumim, Gideon is the chair of the Christian-Israel Common Interest Network. Gideon serves in the IDF reserves as a Military Spokesperson Officer after spending over 20 years in the Armored (Tanks) Corps. Gideon made Aliya to Israel from Queens, NY in 1978.